Javier Ideami has been a serial entrepreneur from his early years. Already as a kid he would be building robots, programming games, composing music, creating artworks and experimenting with electronics and other areas. Ideami developed and produced countless prototypes, experiments and research pieces over the previous years, most of which never saw the light. This page is a tribute to those anonymous and invisible thousands of hours spent on the creation of experiments, research pieces, prototypes and other early stage products. 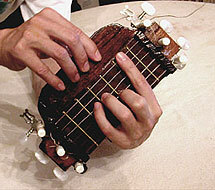 Simi was a device Javier created to help guitarrists like himself practice their craft while travelling. Simi was showcased in one of the most prestigious guitar shops in the center of London and Javier used it for years to practice guitar on his travels. Lander was an electronics powered glove that allowed you to navigate virtual landscapes by moving your hand through the air. Javier developed both the hardware side and the software part which consisted of a virtual landscape created in Assembler machine code. 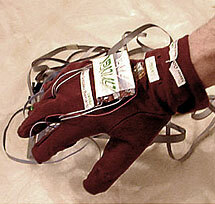 The landscape could be navigated by using the glove which had simple movement sensors embedded in it. Remote was a project that allowed users to control a videocamera located at a different location thousands of kilometers away by moving their heads at their present location. Both cameras were connected through the internet. 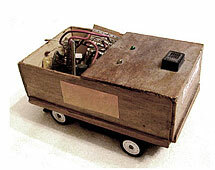 The remote camera was controlled by servomotors that received their instructions through the internet in response to the movements of the head of the user. Those movements were being captured by another camera and processed in real time. 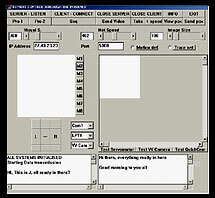 The application was designed and programmed by Javier. Roboti is one of the many robotic experiments Javier constructed in previous years, in this case Roboti was an infrarred controlled small robot that could navigate rooms with real time or pre-programmed sequences of commands. These are only some of the very large list of prototypes and creations by Ideami. Many of those anonymous invisible works were stepping stones towards other more public ones; All in all, they are a celebration of the creative energy and enthusiasm of those who love to experiment and innovate in their lifes.